After the generation I received the following error message shown below. I have the 1.0.93 design time components install. Does anyone know what exactly is causing this error. The project references and versions all match the versions shown above. Your project references the latest Entity Framework; however and Entity Framework database provider compatible with this version could not be found for you data connection. I tried creating EF Designer from Database and Code First from Database but I am still getting the same error. 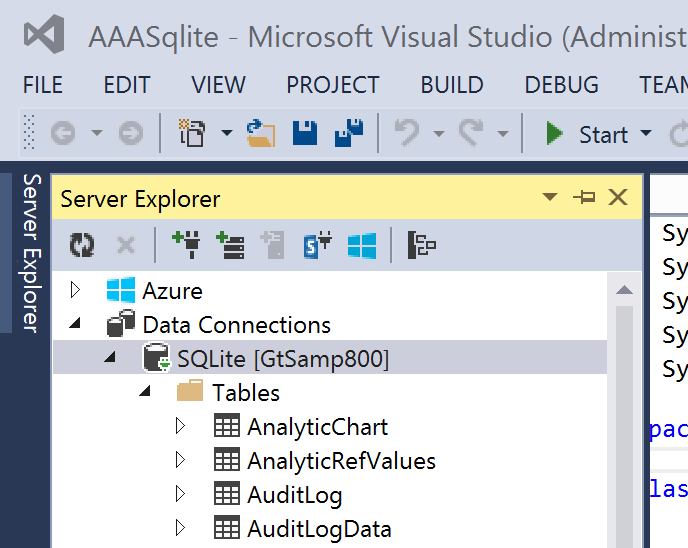 1) When I add the SQLite data source from the tools menu as Tom describes I see the SQLite data provider. I have double checked the registry and EF6 is appended to the invariant name, the SQLite dlls are registered in the GAC. I will try to see what else I can find but at this point I am not sure what to look for. As a side note I have tried dotConnect and it does not work either with EF 6.1.1. Does anyone know if the Entity Framework Designer has a logging option to find out what might be happening? Install the Setups for 32-bit Windows (.NET Framework 4.5.1) installer: sqlite-netFx451-setup-bundle-x86-2013-1.0.93.0.exe (10.00 MiB) (NOT the 64-bit version). This is the only one with the designer. Install and select to install in the GAC and install the Designer for VS13. For the following, the exact order is important! Create a project in VS13. Target the build to framework 4.5.1 and x86 explicitly. Save and build. Next, install the latest EF 6 package (6.1.1) from NuGet. Save and build. Manually add references to the installed SQLite assemblies (including the Designer) , under the Reference Manager under Assemblies you can find the Extensions option for selecting the four added assemblies in the GAC : System.Data.SQLite Core + Designer + for Entity Framework + for LINQ.. Save and build. 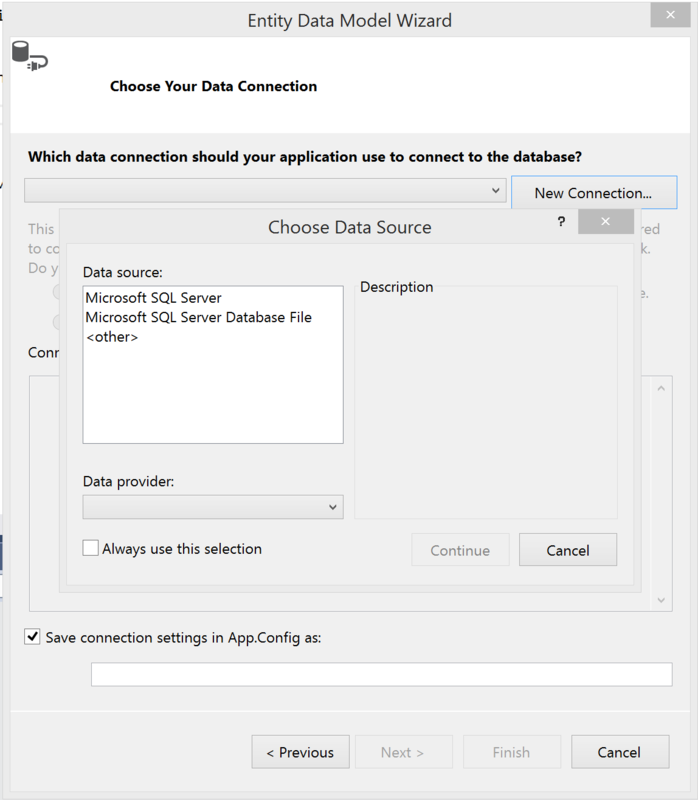 Then create a connection to your database via Connect to Database under Tools. Before you do anything else Save and Build and then RESTART Visual Studio. DO NOT DO ANYTHING ELSE before starting the ADO.NET Entity Data Model wizard, so DO NOT refresh the database connection. When I actually Added an ADO.NET Entity Data Model this way it did present the annoying error, but the Next button is selectable and everything worked regardless (amazingly)! Designer works, retrieving data and writing data works. Haven't tested deployment on another machine though... I'm using Win7 64-bit. 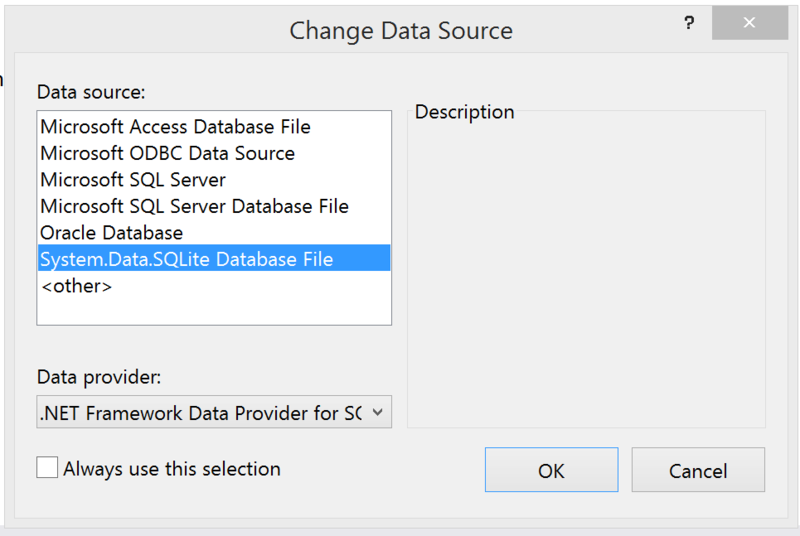 CHANGED UPDATE: To get the correct configuration to actually access the database, you have to install the System.Data.SQLite.EF6 package from NuGet after doing all of the above, then add <provider invariantName="System.Data.SQLite" type="System.Data.SQLite.EF6.SQLiteProviderServices, System.Data.SQLite.EF6" /> to the App.Config and remove the other providers and remove everything in between <system.data></system.data>, otherwise you'll get some exception. But note that this means that every time you want to update the EDMX model, you have to change the App.Config invariantName="System.Data.SQLite" to invariantName="System.Data.SQLite.EF6" and vice versa. within the resulting "app.config" or "web.config" file. As you can see, somehow in the end, for me, it was not necessary to remove "EF6" from invariantName or to remove or rearrange other providers or default connection factories. I didn't have to do any reg hacks. 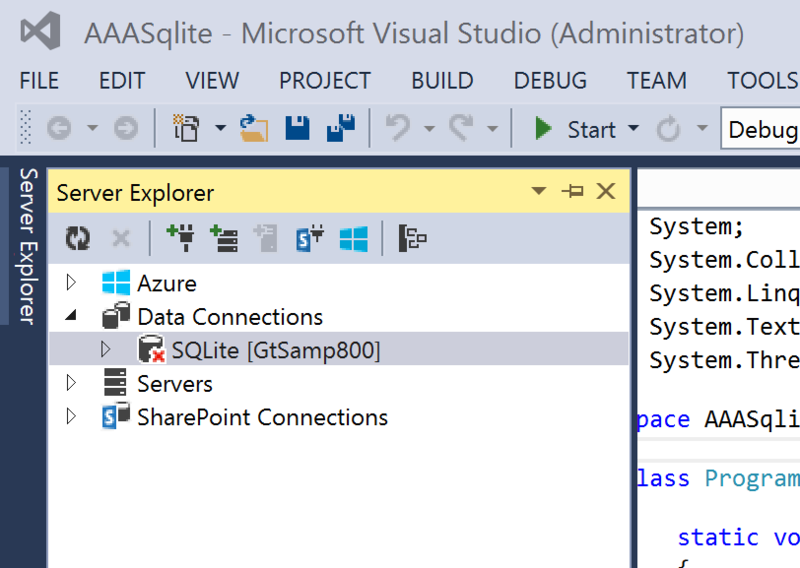 Rearranging add/remove tags (that were added during NuGet System.Data.SQLite 1.0.94.1 package installation) in the start-up project's app.config made the difference. After all the above, I updated EntityFramework to 6.1.2 via NuGet and both updating the model from database via designer and accessing the data at runtime still works. EF6: versions 6.0.0 to be 6.1.3 (currently the latest version). System.Data.Sqlite: 1.0.93 - 1.0.95 but not 1.0.98 (currently the latest version). To avoid getting System.Data.Sqlite 1.0.98 , do not install using Nuget Package manager. Manually install System.Data.Sqlite. Unfortunately, http://system.data.sqlite.org/ does not readily list previous downloads. I had the exact same problem--The model designer wizard was not showing my sqlite db in the dropdown list. I was able to resolve it by fiddling with the sqlite db connection and tables. Another step I did not include above was I created and deleted an .mdf SQL server database New Item... > Database Service.... I did that shortly before trying the above steps. I assume that wouldn't matter but you never know. Not sure what exactly did it. It seemed a manual disconnect and reconnect through the server explorer made VS "wake up" and display the server in the list. Try fiddling with the connection and tables a bit to see if that wakes something up. Delete the old solution and set it up anew, just like you did (might not be necessary). The sqlite data source should now be available. Not the answer you're looking for? Browse other questions tagged entity-framework sqlite or ask your own question. How to bind a DataGridView to a SQLite Database? How to re-create database for Entity Framework?